“Denizlere hakim olan dünyaya hakim olur.” düşüncesiyle hareket eden İngilizler, boğazları ele geçirmek için donanmanın yeterli olacağına inanıyorlardı. Bahriye Nazırı Churchill’in planları Akdeniz filosu komutanı Amiral Carden tarafından da desteklenince, Lord Fisher’ın şüpheli gördüğü bu harekatın donanma ile yapılmasına karar verildi. Tarihinde hiçbir yenilgi almamış olan İngiliz donanmasının silah, teknoloji ve başarı açısından kendine güveni tamdı. Dünyanın yenilmez donanması, Fransa’nın da desteği ile dünyanın en büyük armadasını oluşturuyordu. Bu donanmaya karşı gelebilecek hiçbir güç düşünülemezdi. Hele ki yıpranmış, teknoloji açısından zayıf ve parçalanmak üzere olan Osmanlı, bu armada ile asla baş edemezdi. 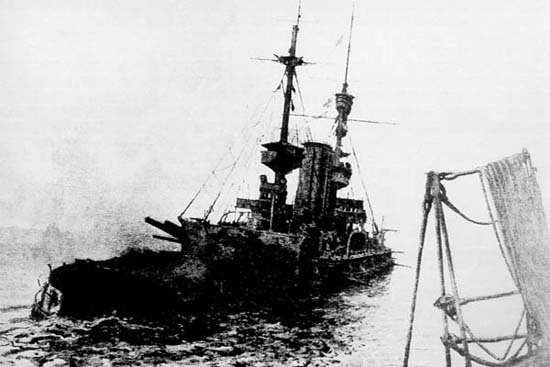 The British acting with the concept “the one rules the seas, rules the world”, believed that it was possible to open the Dardanelles “by ships only”. Before The Naval Attack was instituted, First Lord of the Admiralty Churchill asked the officer commanding the Aegean, Vice-Admiral Sackville Carden. Carden stated that he believed the Dardanelles could be forced, given sufficient warships and minesweepers, in a three stage plan; first a neutralisation of the Turkish forts guarding the entrance, then a clearing of the Turkish minefields, and finally a drive into the Sea of Marmara. This plan persuaded the War Council despite Lord Fisher’s doubts. The British Navy was proud of its ammunitions, technology, and surely, its victorious history, full of uncountable successes. It was impossible for the frayed, collapsing Ottoman Empire to withstand this invincible armada supported by French warships. Allied Armada’s naval attack began on 19 February 1915. Until 13 March 1915, they continuously bombarded the Turkish forts and opened a way for the minesweepers. However, they had confronted with the Turks’ tough resistance. The Turkish gunners did not bother to reply the Allies’ bombardment. This showed that, to open the Dardanelles was not that easy and the Allies could have cleaned only the first five miles of the strait. On 17 March 1915, Admiral de Robeck was in charge to proceed the plan in place of Admiral Carden. In respect of Carden’s plan, the Allied Fleet appeared in the entrance in the morning of 18 March. De Robeck himself commanded the Fleet’s most powerful squadron. In bright sunshine and without the possibility of surprise, de Robeck in HMS Queen Elizabeth led the first wave up the channel at 10:30. Queen Elizabeth’s target was Mecidiye fort, HMS Lord Nelson was going to bomb the Namazgah fort and HMS Inflexible’s object was Hamidiye fort. This was called as “A Line” and it was begun to be proceeding at 11:30. De Robeck’s most powerful ships commenced to bombard the central forts. 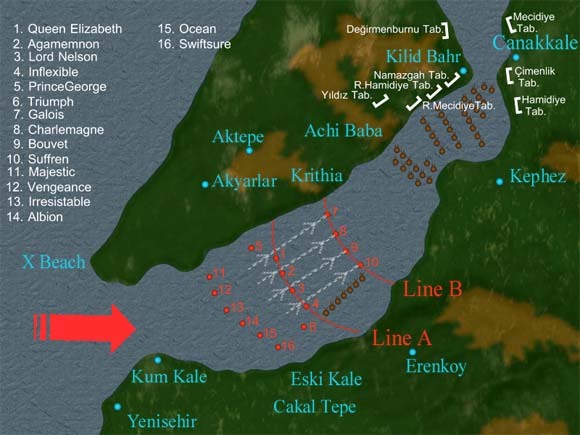 Meanwhile, Allied Fleet had entered the fire line coming from Kumkale. 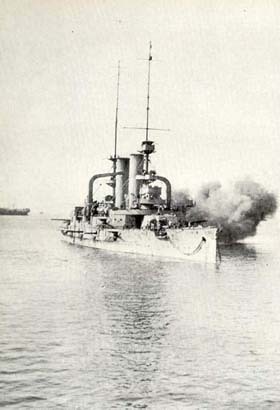 Turkish hotwizers began to fire, but their guns could not cover the distance and the gunners failed to reach the ships. 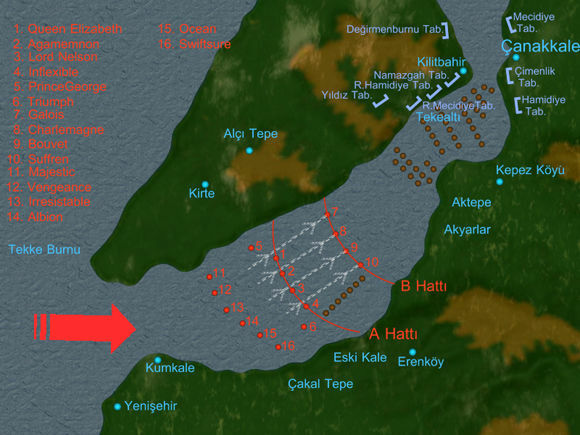 At midday, Allied Fleet had destroyed the Cimenlik and Hamidiye forts. De Robeck signalled his second wave to go in closer, Guepratte’s French squadron, Bouvet, Charlemagne, Gaulois and Suffren with HMS Triumph and Prince George. This step of the plan was called as “B Line”. Guepratte led his squadron through the British line and subjected the shore defences. Under Turkish gunners’ heavy fire, the squadron had reached the B Line. After a mutual bombardment, the Allies had succeeded to stop the middle forts but the central forts continued to fire. Two British ships, HMS Triumph and HMS Prince George had taken their positions in A Line and they targeted Mesudiye and Yildiz forts. As the French ships led by Suffren had their return, wheeled away to make room for the second squadron, something unexpected had happened, around 14:00. 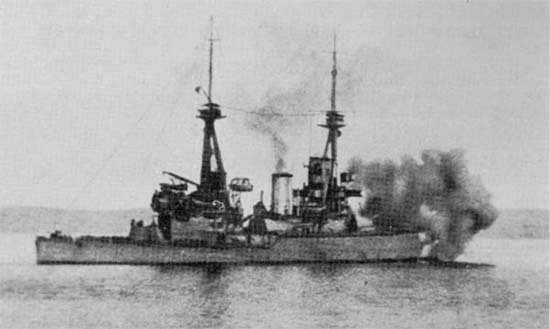 French ship Bouvet following immediately Suffren hit a mine and within two minutes had disappeared entirely, with the loss of almost all her crew. As the steamboats immediately arrived to rescue the crew, they only could save 20 people’s lives. At 12:30, Gaulois hit a mine but she could have left the strait with a serious stroke. 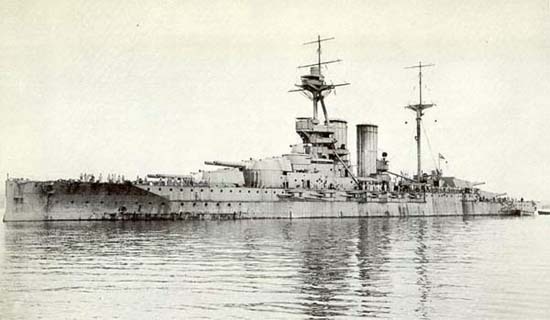 At 15:30, Inflexible hit a mine not far from the grave of Bouvet. The events in 18 March confused the Allies. Churchill’s opponents like Lord Fisher had turned out to be right, it was impossible to open the strait “by ships only”. Nevertheless, de Robeck and Churchill were still insisting that a renewed push would succeed. They began to renovate the plans for another naval expedition to Istanbul.